Five months ago, Technical Illusions gained over a million dollars in funding thanks to a highly successful Kickstarter campaign for castAR, a projected augmented reality project that company founders Jeri Ellsworth and Rick Johnson brought over from Valve when they were laid off almost two years ago. Ever since the campaign's success, the company has been ramping up prototyping on a rapid scale so that the final unit can be sent off for mass production. Along the way, the company has grown from two employees to 11, and Ellsworth has since moved from Portland to Seattle to be with the team (dragging her collection of 80-plus pinball machines along with her). Ellsworth has also just hired the services of a Japanese company (she won't name which) to provide her with improved optics and thinner circuitry, which she admits is better than the homemade solutions she and her partners have cobbled together so far. This all means, sadly, that castAR is still very much in progress, which is why even though Technical Illusions is here at GDC 2014, we were unable to look at the final castAR hardware. We were, however, able to take a look at castAR's latest prototype that has never before been seen outside of Technical Illusion's office until this week. The hardware is, without a doubt, leaps and bounds ahead of what we saw last year. As a reminder, here's the way castAR works: a pair of active shutter glasses with tiny projectors casts 3D images onto a retroreflective surface which are then returned to your eyes. At the same time, a camera module in the eyewear scans for infrared LEDs on the surface to track the location and movement of your head. The initial builds for the castAR glasses were very rough around the edges, but understandably so -- they were initial builds, right? The latest iteration, however, is far cleaner and smoother in appearance. The circuitry and guts of the headset are now relegated to the right temple, leaving just the projectors and the camera perched above the glasses, which lessens the weight above the nose bridge. Further, the camera part has a much lower profile and doesn't jut out as much as before. That along with the projectors are also now housed in a simple black plastic block. It doesn't seem like much, but it's a lot tidier than previous versions that exposed visible wiring. Ellsworth says they plan to attach a thinner cable to the glasses as well, again to reduce the headset's overall weight. In the end, she hopes the final unit will weigh less than a 100 grams each. 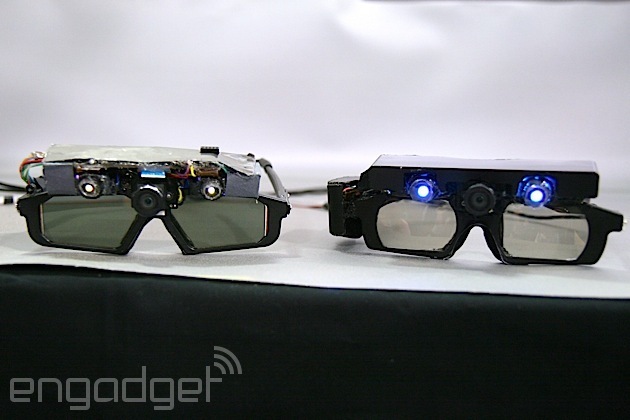 What's perhaps more interesting than the design however, are the new tiny projectors embedded in the glasses. The projectors, located above each eye, now have full 720p HD resolution. Not only that, but according to Ellsworth, they also project more light along with richer, more uniform colors. In our brief hands-on with the castAR prototype, we can certainly tell the difference between it and the older standard-definition model. Images were visibly brighter and sharper, and we could lean down toward the display and make out finer details than before. We tried our hand at a beta zombie game that Technical Illusions developed in-house to demonstrate the glasses, and while gameplay was a little unrefined, we could see that the graphics seemed crisper than the other demos in the room. Also, each projector has a 65 degree field of view, while the camera for head tracking has a 125 degree field of view, though Ellsworth promises us that the final version will have a 145 degree view instead. This means that you could cover a much wider surface area with castAR's retroreflective material for an even larger game environment. As we were finding out about castAR's progress, we also took the opportunity to ask Ellsworth and her team about their involvement in the Immersive Technology Alliance (ITA), a virtual reality collective that launched last week. As a founding member of the alliance, Technical Illusions sees the ITA as an advocacy group for virtual and augmented reality and the benefits immersive technology brings. Brian Bruning, who heads up Technical Illusions' marketing and business development, says both VR and AR have uses far outside gaming, and can be used in training, education and medical imaging. One of ITA's main duties would be educating the public and developers about those different avenues. Additionally, Bruning said that as VR and AR are still so new, that the various outfits in the organization can take the opportunity to learn tips and tricks from each other. Technical Illusions, as one of the rare firms doing projected AR in addition to VR, is well-positioned to both teach and learn in those areas. Speaking about projected AR in particular, Ellsworth says, "Projected AR is very graphical and visual, but it's not just staring at the screen." One of the benefits of AR as opposed to VR is that you can simply lift your head and still interact with the world. "This comes into play especially with the social aspect of games," she says, pointing out that part of the fun of playing a video game with pals is being able to see your friends reactions. "It's a fresh spin on games," says Ellsworth. "A new driving force." Seeing as castAR managed to get 3,863 backers on Kickstarter, it certainly seems some people think so. The first developer and Kickstarter prototype units will be available this summer, while the rest of Kickstarter and the first commercial units should ship by Q4.